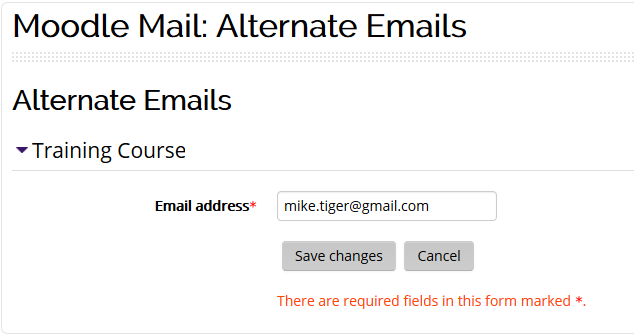 Instructors can set up an alternate email address in the Moodle Mail block. This will give instructors an option to send an email from their own LSU email or a different address. Replies to emails will still be sent to the instructor's LSU email address. NOTE: An alternate email address will need to be added to each course. The setting is customized for each specific course. 1. Log in to Moodle and select your course. 2. In the Moodle Mail block, select Alternate Emails. If you DO NOT see the Moodle Mail block, you may need to TURN THIS BLOCK ON. 3. You will see a screen with any email address you have already set up. If you have not added an email address yet, click Continue to add one. 4. Add the alternate address to the field Email address and click Save Changes. 5. A verification emaill with instructions on completing the process will be sent to the address you entered. The email will contain a link, which requires you to enter your PAWS credentials. Click Continue. 6. Once you have clicked on the verification email and signed in, you will get the message below. Click Continue. 1. 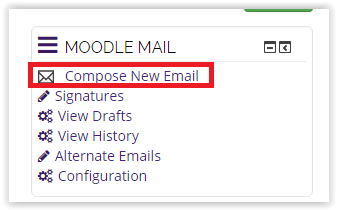 Log into your course and click on Compose New Email in the Moodle Mail block. 2. You will see a drop-down menu to the right of the From field. Click the arrow and select the email address from which you want the message delivered. Continue composing the email. 1. Log into your course and click on Alternate Emails in the Moodle Mail block. 2. You will see the Alternate Email page with any email addressed you have added to this course. To Edit the email address, click on the pencil icon under the Action column. To Delete the email address, click the red X and confirm the deletion. *NOTE: You will need to do these steps if you do not see the Moodle Mail block on your Moodle page. 1. Log into your course and click Edit in the top-right corner of the page to turn editing on. 2. Select Moodle Mail in the Add a Block drop-down box.